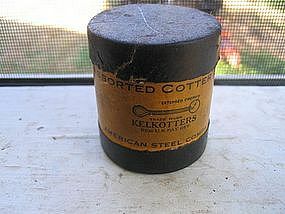 Cardboard box of 71 assorted cotter pins from Kelkotters/American Steel Company. Age related damage to the lid (see photo) as well as a hole in the bottom of the box which seems to have been made by protruding pins. Complete detailed photos by email. I need your zip code to calculate the postage.